Earning extra money in any given month doesn’t require getting a part-time job. In fact, you don’t even have to go out of your way to add to your monthly income. 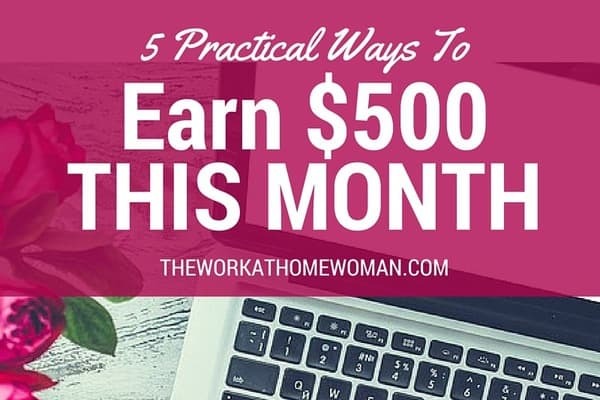 You can take your existing skills and the things you already have lying around the house and turn them into a nice chunk of change by the end of the month. So, whether you’re looking to pay down debt, need a little boost to pay a bill, or simply want to add some bank to your emergency fund, here are five practical ways to earn $500 (or more!) this month. What are you good at? No matter your skills or talents, someone is willing to pay you for them. On popular freelance marketplaces, like Freelancer, Upwork, and Guru, you can sign up and starting bidding on projects that are perfectly suited to your skills and interests. You have complete control over your earnings and can work as much or as little as you’d like. The skills or services you sell are entirely up to you. Some of the most popular offerings include content writing, web design, social media management, and graphic design. These are just a small sample of popular ideas but, really, you’re only limited by what you’re willing to work on. The best part is, when you’re doing things you enjoy, it doesn’t feel like you’re actually working. That’s probably why so many people start freelancing to earn extra money and end up turning it into their full-time career. Thousands of people embrace the sharing economy by being a part of peer-to-peer marketplaces like TaskRabbit, Airbnb, and Rover. You too can quickly and easily sign up for these sites and start earning extra money, one gig at a time. It’s not unreasonable to think you could earn a substantial income every month running errands, listing a spare room, or even dog sitting. After all, the average Airbnb host can pay for 81% of their rent or mortgage each month just by listing one bedroom for use on this popular room-sharing site. If you don’t have an extra room to spare – no problem! Have a car that’s just gathering dust in your garage? Consider signing up for the car-sharing site, Turo. The average person can earn $6,501 a year lending out a car that otherwise takes up space in their driveway all day. If you look around your home, you probably have plenty of items in your closet or junk drawer that you don’t use anymore. These items, like clothes, electronics, and books, are often of some value and can easily be sold online (you don’t even have to worry about shipping costs!). The clothes you don’t wear anymore can be sold on sites like thredUP where bargain hunters are willing to pay for gently your used clothing, shoes, and accessories – you may even be able to sell your kids clothing, too! Closets aren’t the only place you can discover extra cash just lying around the house. Your junk drawer probably contains valuable electronics that you can sell on sites like Gazelle. They’ll send you an instant quote for your item and pay you to ship it to them – even damaged electronics and smartphones with cracked screen may be worth something. Selling used books you may have can also quickly build up your monthly cash reserve, and is super easy to do when you use an app like Cash4Books. Simply scan a book’s ISBN and you’ll get several quotes from sites who want to buy it. Decluttering will never feel as good as it does when you make extra money while doing it. There are a lot of little tasks out there just waiting to get done. That’s why some big-name companies turn to crowdsourced sites to gain access to millions of on-demand workers in order to get more done. When you join micro job sites like ClickWorker, CrowdFlower, or mTurk you can easily earn money in a matter of minutes. If you make it a habit to sign in and work whenever you have a little downtime, you’ll be amazed by how quickly you can build up extra cash. Fancy Hands is another site that works on a crowdsourced platform where virtual assistants can claim tasks on a first come, first served basis. Not only can you help busy professionals, solopreneurs, and small businesses get more done, you can make extra money just by helping others tackle their to-do lists. Crowdsourced sites almost always have work available, day or night, which is great if you keep unconventional hours or need to work around an already jam-packed schedule. You probably have a lot to say, but when’s the last time someone actually paid you for your opinion? There are many companies that want to hear your thoughts and will actually pay you for them through usability tests. The average usability test takes just 15-20 minutes to complete and can pay up to $15 but, on average, you can expect to earn $10 for each one you complete. You don’t need any special skills to become a tester for companies like User Testing, just an ability to speak your thoughts out loud as you navigate a website and perform routine tasks. Another opinion-paying option comes courtesy of the many survey panels out there. While it might be a stretch to hit the $500 mark in one month just from taking short surveys, you can easily reach your goal by opting into any paid market research opportunities they have, like online focus groups. These sessions take place in a chat room setting or through forums and can pay $100 or more each. The more of these panels you join, the more opportunities you’ll have to earn. Many times, you’re awarded for your loyalty and will be presented better and higher paying studies the more you participate as a panelist. While all these ideas are practical, some may be better suited to you and your situation than others. The best way to pick? You could try them all and see which you like best or simply look at your financial goals objectively and be honest about the time you’re able to commit to achieving those goals each month. If you’ve only got a few moments to spare in a given day, perhaps micro jobs and short task sites are your best bet to supplement your monthly income. For those who want to try their hand at something new, freelancing just might be the way to go. How much extra you earn in a month depends on how committed you are to earning. Whichever of these practical ideas you choose, you’ll be well on your way to earning extra money in any given month. Ashlee is a freelance writer and blogger who embraces the gig economy and all the money-making opportunities that come along with it. She enjoys helping others find happiness in working on their own terms with remote, freelance, and home-based jobs. 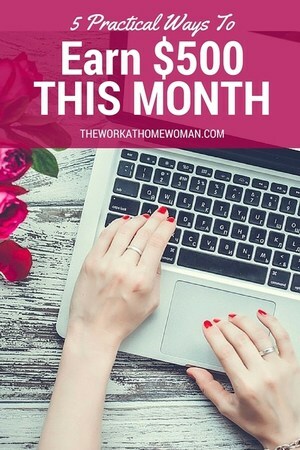 Follow along with her practical advice and actionable ideas over at Work from Home Happiness. I’m not really a fan of thredup. I had name brand clothes that were brand new and maybe have made a total of $10 in credit. It’s kind of insulting to me personally because I paid good money and it was all clothing I got for my kids in the last 6 months. Hi Allison, If I have something that is name brand and I know I can get more selling it on Craigslist, I do that. But the majority of my daughter’s clothes are from Old Navy, and I know that I’m not going to get a lot for them no matter where I sell them. Also, I was giving my old clothes and my daughter’s old clothes to Goodwill and earning nothing, so I enjoy using thredUP. I always take the credit and let my daughter pick out new stuff for herself. Thanks for sharing your experience! Hi Samantha, I haven’t heard of those, sorry. If you don’t want to use an online marketplace, try selling in-person on Craigslist or VarageSale. We have a local swap group on Facebook that I use to sell things all the time. Good luck and happy vacation! I have been doing these sites for a while and have cashed out significant profits. Worth the time investment. I’ve seen several sites for selling used clothes. Is there any reason why you mentioned Thread Up in particular?I’ve wondered how the sites compare in terms of service fees, ease of use, customer satisfaction, etc, but I can’t try them all to find out which site is the easiest or more lucrative.I’ve seen Vinted, Thread Up, Yerdle, Do you know these ? I’ve been using thredUP for a couple of years now and I LOVE it! All you have to do is order a bag online (which is free), fill it up, and send it off (which is free). It takes them a few weeks to process — but once they do you can get store credit or cash. I usually take the store credit because their merchandise is awesome! I’ve bought shoes, kids clothes, shirts, pants, and shorts. You don’t make a ton — but the time and hassle it saves is worth it. If you have something like a new handbag or pair of jeans — I wouldn’t use thredUp for those items, personally I would try and sell those on Craigslist for a higher price. Also when you refer friends to thredUP they get $10 to spend and you get a $10 credit – which is a win-win situation. I’ve heard of those other sites, but haven’t tried them out. On Yerdle you don’t make money — it’s solely a swap site. Thanks for sharing your experience, Micki. One thing to note with thredUP is they do all the work — they take the photos of your items, they list them, and if an item doesn’t sell, you still get paid for it. Poshmark and Tradesy are more like eBay in terms of how they work. One day I’ll have to test them all out and write a comparison post.